I haven't blogged in days and days so I thought I'd drop a few lines to let y'all know I'm still alive. The Evil Gut Pain is rearing it's ugly... gut... and I've got a killer headache so please overlook anything that doesn't make sense. I think if I wait until I feel one hundred percent articulate to blog then I'll never blog again. The weather has been absolutely perfect here. I've been enjoying little vacations in the porch swing with the sun on my face. There are about five months out of the year where the weather is too hot and muggy to endure and there are about three months out of the year where the weather is too cold for comfort. I intend to make the most out of the good ones. Well, I intend to spend a little time outside every day, anyways. It's incredibly peaceful to just sit and stare at the lake. 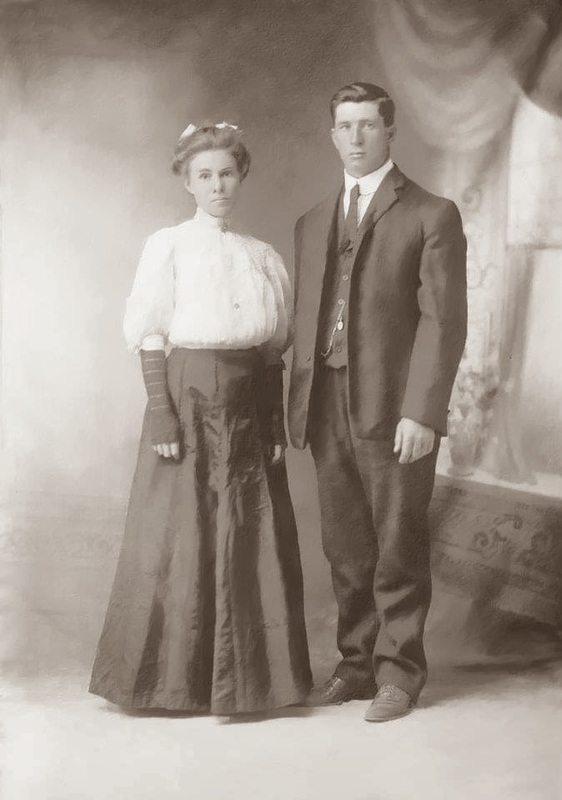 My great-great-grandparents, Ezra and Lidia Worden Clow. He was born in Ontario, Canada in 1844. (Yes, I'm 1/16 Canadian. Who knew, eh?) She was born in 1852 in Pennsylvania. 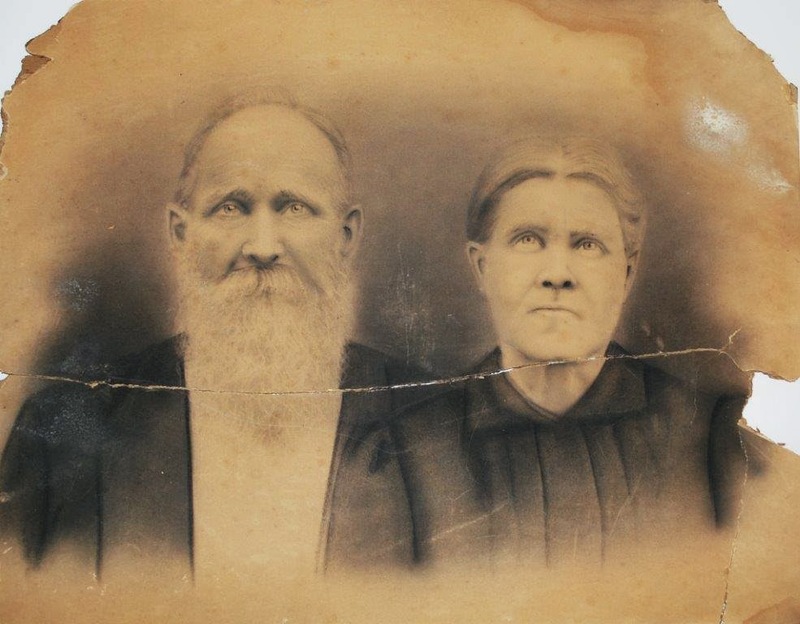 They married in 1870. Their daughter, Alice Susan Clow is pictured below on her wedding day. She married William Judson Pennington in Miller, Missouri in 1905. Their son, Clarence Burl Pennington was my mom's dad. We are so blessed to have these old photos. I'm thinking of putting together a book of these. I have loved Shutterfly for making photo books but they are so pricey. If any of you have suggestions for a more affordable printing method, I'd love to hear. It must be user friendly because I'm not nearly as tech savvy as I should be. Speaking of family... one of my cousins is having a horrible time with migraines. They are completely disabling her and she is newly married... she needs to be enjoying life! She has been unable to leave the house except for doctor visits and necessities since the beginning of February. It absolutely breaks my heart that she's going through this because (unlike me) she is very social and loves being out and about. She is seeing a neurologist and they are running all sorts of tests but so far, no relief. My heart is so soft for people who are unable to go and do and be all they want to be because... well, you know, I get it. I have another cousin - a second cousin, actually but that still counts! - who is due to deliver her first child any day now. Her mother and my father were born in the same week and lived in the same house - 1001 Oakdale Rd - and were brought up more like siblings than cousins. Sadly, her mom died tragically the week before I was married in Vegas. I'm so happy for Rachel to be having this new baby, I just can't help but wish that Leslie was here to enjoy being a grandma. She would have been an amazing grandmother! I guess that's about all for now. Back to my Mad Men mini-marathon... then on to my Grey's Anatomy mini-marathon... and I've got to dig through a half dozen boxes to try to find my Grandma's birth certificate which might not even be there... as soon as Austin wakes up to bring the boxes out from under the stairs. Hope you all have a great day and recover painlessly from the loss of that pesky hour sacrificed to Daylight Savings Time. Heather, check out Groupon, Living Social and other online coupon websites. I subscribe to them and get emails of offers. There are frequent offers for photo books. Also if you have a Walgreens or CVS in the area that has the photo dept, if you sign up for their emails they send coupons all the time for various photo projects, especially Walgreens. I've seen them advertise for photo books many times on the Walgreens emails.